The FT-IR and FT-Raman spectra of 3-(prop-2-en-1-yl)-2-thioxo-1,3-thiazolidin-4-one (C6H7NOS2) were recorded and analyzed. The surface enhanced Raman scattering (SERS) spectrum was recorded in a silver colloid. 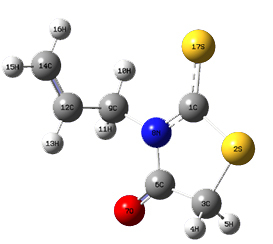 The molecular geometry and vibrational wavenumbers were calculated theoretically using Gaussian09 software package. Potential energy distribution of the normal modes of vibrations was calculated using GAR2PED program. The observed wavenumbers were found to be in agreement with calculated values (SDD). The ring vibrations, 1064, 1018 cm-1 (CN stretching modes), 800, 666 cm-1 (CS stretching), 1650, 537 cm-1 (C=O modes) and 600, 486, 415 cm-1 (deformation modes) present in the SERS spectrum suggests the interaction between the ring with metal surface. The presence of in-plane and out-of-plane ring modes suggests a tilted orientation with respect to the metal surface. The significant shift and broadening of the symmetric stretching mode of CH2 mode in the SERS spectrum indicates the closeness of ring portion of the title compound near the metal surface. The predicted infrared intensities, Raman activities and first hyperpolarizability values are reported.